Cooperative games are a chaotic mess. More often than not there is a shared goal where players are supposed to come together and work as one in order to win. A few cooperative games do this well, like Pandemic or Forbidden island, and to an extent the D&D board games unified goal of "Get 'em" works for it. So much i happening all at once that it can be hard to keep track of what is happening, especially when players get to choose 2 or 3 actions from a list of like 40 things that they get to do during their turn. Yet through it all, everyone is on the same page, they do it up, and in the end its usually a pretty fun time, win or loose, because we're in it together. The shared experience, its what mom always wanted, where you play nice with your brother and sister and everyone has fun. Then theres the games with the dirty traitor. 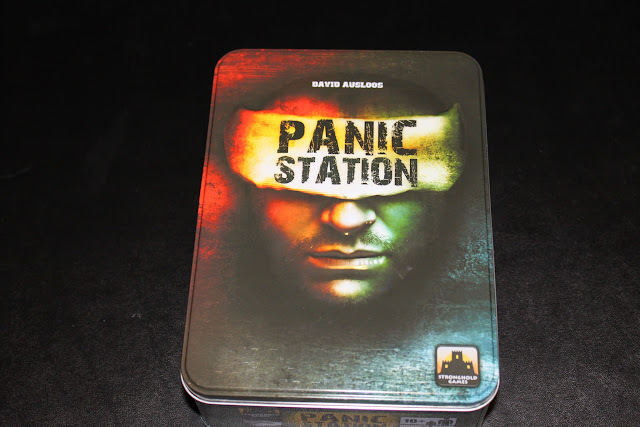 Panic Station from Stronghold Games is a cooperative game with a traitor mechanic designed to be full of paranoid delusions where in the end you're out to get everyone you came to the station with, because they are all out to get you. See, at Panic Station, theres a hive of parasites who want to kill you dead. You and your l33t team of androids and marines show up to kill them dead, yet along the way, someone gets infected and betrays the rest of the team, slowly infecting everyone else to protect the hive. Sounds fun, right? In the tin box (TIN!) 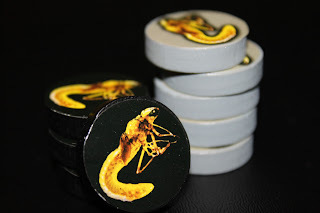 you'll find wooden discs representing marines and androids (2 per color), parasite wooden discs, item cards, room cards, player cards, infection cards, positive/negative test cards, a board to put the positive/negative cards on, and a die. So, to play the game, players start off with four actions with which they can choose to do a combination of 7 different things (move, explore, search, use the computer, use an item, heal, or shoot your gun) that they can split accordingly between either their android or marine. If there are parasites present in the station, then they will have a chance to move and attack the players, which can impact how many actions they can have per turn (actions are directly related to the players health). During the game, the players are trying to work together to explore the station, find the hive and destroy it the only way they know how - with a flamethrower. 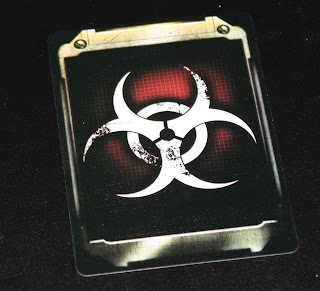 Along the way, a player will become infected and will secretly try to turn the other players into infected as well. But, the players can thwart them by using future sciences best cure for infection - gasoline. Fun fact, in order to win the game, your marine must use gasoline with their flamethrower to incinerate the hive. Now, there is more to it than this, but not really. Somewhere in the top 8 cards of the item deck is a host card that causes one of the players to betray the others. In theory, it should be The Resistance meets Pandemic with the cast of Aliens, what could go wrong? So...I'm not sure if it was the group that I was playing with, but something went wrong. Now, according to the game, everyone starts off in the same room and moves out from there in search of the hive. You have to search the room during your first turn, which causes you to draw cards from the item deck. 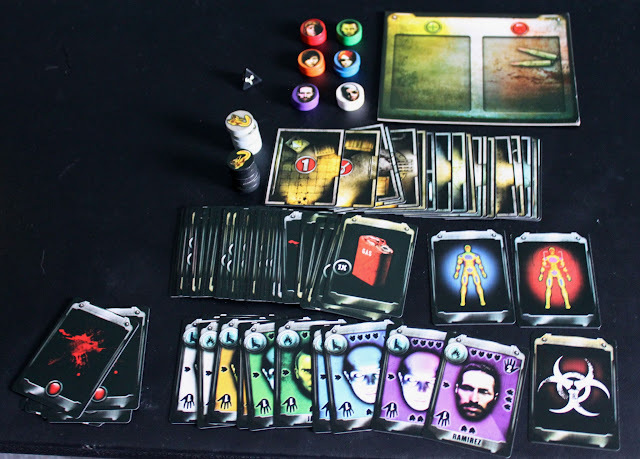 Since the host card (the card that makes you the traitor) is one of the first 8 cards in the deck, this card can be acquired within a players first two turns. When you enter into a room with another player, you have to trade a card from your hand with them, which is how you, the infected, can infect others. Thats all well and good, but if the first card that you draw from searching is the Host card, you might as well strike while the iron is hot, especially in a 4 player game. Well, thats at least what happened in our game. 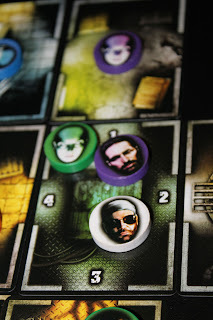 My wife got the Host card first draw, then proceeded to track down the other 3 players, and infected them immediately, winning the game within 2 turns. Of course the problem with this is that then you need to still find the hive since the only way for the infected to "win" is to do a heat scan at a computer terminal. Theres only one public terminal to use, so unless you can find a keycard to get to a private one, you have to explore and find one. So, onward we explored, but along the way we also managed to set off about 7 parasites who were running around the station. at one point, we had 5 in the same room, and it was instant death if you came across them since the only way to kill them is using the android who is the only one with a gun. Now, I don't know about you, but I learned something from Terminator - DON'T GIVE GUNS TO THE ROBOTS BECAUSE THEY WILL TURN ON YOU!!! Seriously, we as society are doomed if we don't learn from our historically inaccurate mistakes in the future through the eyes of Hollywood. This happened in Terminator, the Matrix, I Robot, Captain Power, Centurians, and countless others. This is especially true because the infection is also communicable to the androids. THIS IS WHERE IT STARTED PEOPLE. IT STARTED AT PANIC STATION! Ultimately, I was underwhelmed by this game. 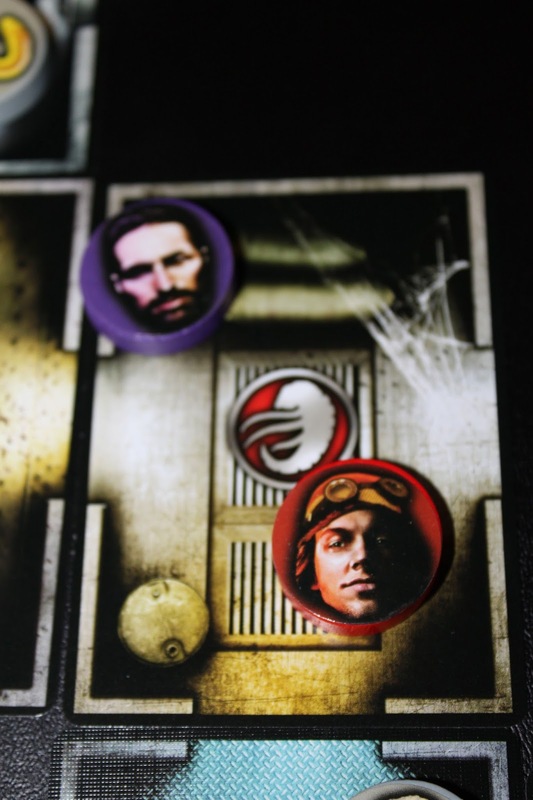 It was promised to me as Battlestar Galactica in 45 minutes, full of intrigue, excitement, and paranoia. Instead, I was just bored with it. 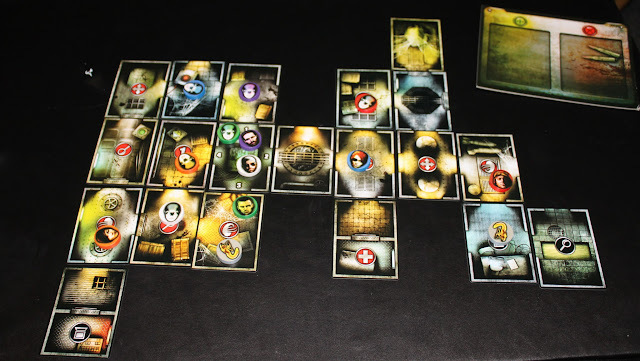 We played 3 games back to back because the rules were not particularly well written for ease of play, so the first game is a given that it didn't go according to plan. But, the reason for the third game is because we wanted to like it, so maybe if we play it again the way its supposed to be played, it'll be fun. Nope. Playing it the way its supposed to be played is just as equally underwhelming, which is a shame. There are some clever mechanics to the game, and at its heart its a cooperative game of paranoia. If we were to tweak it a bit and make some specifically drastic changes to the rules, I think it'd meet its hype. I think it'd actually be a great senario for the D&D board games, but as a standalone, I wasn't in a panic by the end.